I remember the first time I saw the iPhone’s accelerometer functions work. “This is going to be perfect for maze games,” I said to myself. And I was correct, as evidenced by Codify AB’s fabulous Labyrinth. Ball to the Wall: Keep the steel ball away from the holes in this iPhone interpretation of the classic trap game. At some point in your life, you’ve probably toyed with a puzzle that features a steel ball you have to roll through a wooden maze. 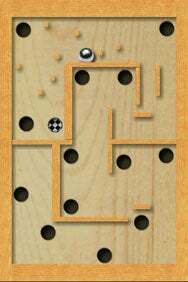 You tilt the maze board up and down to move the ball using little dials on the side of the box, carefully avoiding the holes that will swallow the ball. Using some simple but effective graphics and the iPhone and iPod touch’s accelerometer features, Labyrinth is precisely that game: The difference is that instead of one maze, you have more than 500 levels to master. What makes Labyrinth exceptional is that the game features really high accelerometer accuracy. You need to hold the iPhone parallel to the ground—in fact, there’s a calibration tool in the game that helps makes sure you’re playing on a flat surface. (Two images of bubbles suspended in green liquid, as you’d find in a carpenter’s level at the hardware store, do the job.) Once you’re set, you’ll find that the game very closely imitates how a “real” steel ball would roll around—even to the point where you can “slide” your ball around the edge of a hole without letting it fall in (an improvement in the recently released 1.2 update). You won’t find any music or sound effects here, by the way—not even the subtle roll and clunk sounds that a “real” Labyrinth game might have, which I would like to see. The game’s interface is austere, too. Outside of calibrating the iPhone and downloading levels, you’ll see no options, and the only reward you get between levels is an congratulations that you completed the level with the time indicated in seconds. But Labyrinth’s developer is keenly aware that even iPhone gamers want to “kick the tires” before putting down their money, so it developed Labyrinth Lite Edition, a free version with only a few levels to give you a sample of what the full game has. It’s worth a look if you’re not ready to make that $7 commitment right away. Labyrinth is compatible with any iPhone or iPod touch running the iPhone 2.0 software update.